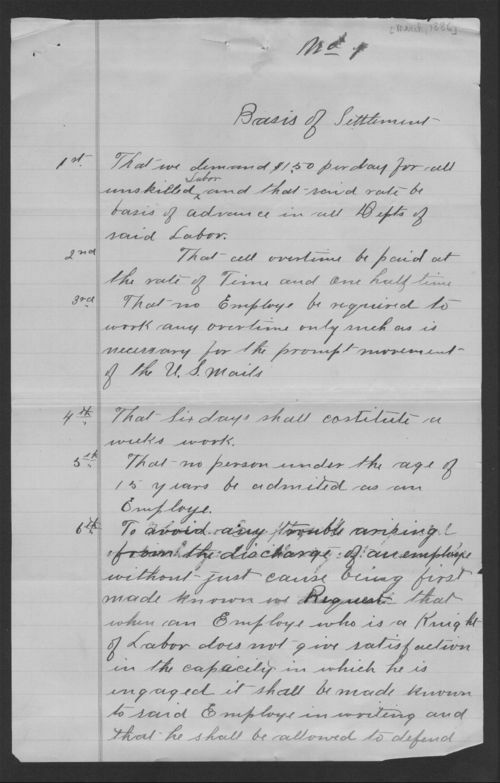 This document from Kansas Governor John Martin's correspondence may have been written by the Knights of Labor and outlines eleven demands termed the "basis of settlement" for strike negotiations. The railroad strike of 1886 resulted from failed negotiations between railroad management, mechanics, and shop workers dating back to October 1884 when workers were notified of a 10% pay reduction. This made them the lowest paid railroad workers in the tristate area (Missouri, Arkansas, and Kansas). A few months later, hours were also reduced. Workers argued they could not support their families.